Monifieth being located in South Pictland, the learned gentlemen of the kirk , narrowed down the establishment of Christianity in the area to between 570 / 580 AD. The close proximity of the Laws, with it`s fortifications, broch etc., in association with the souterrains at Ardestie, Carlungie and Ardownie, it was most certainly a very important Pictish settlement. This theory is substantiated by the recovery of sculptured stones, which formed part of the pre Reformation building, with some being incorporated into the present Church. In 1864 the recognised stones were removed and presented to the Museum of Antiquities in Edinburgh this included the Monifieth Cross. 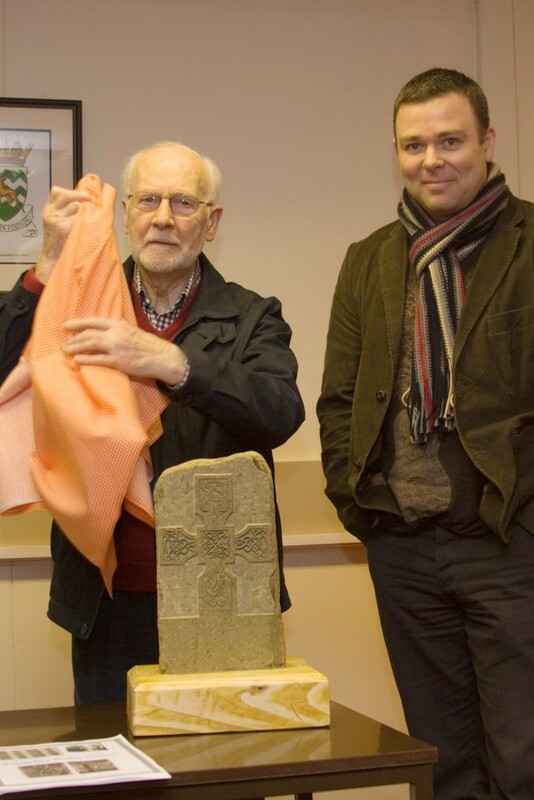 Now a Pictish replica has been gifted to Monifieth Local History Society. 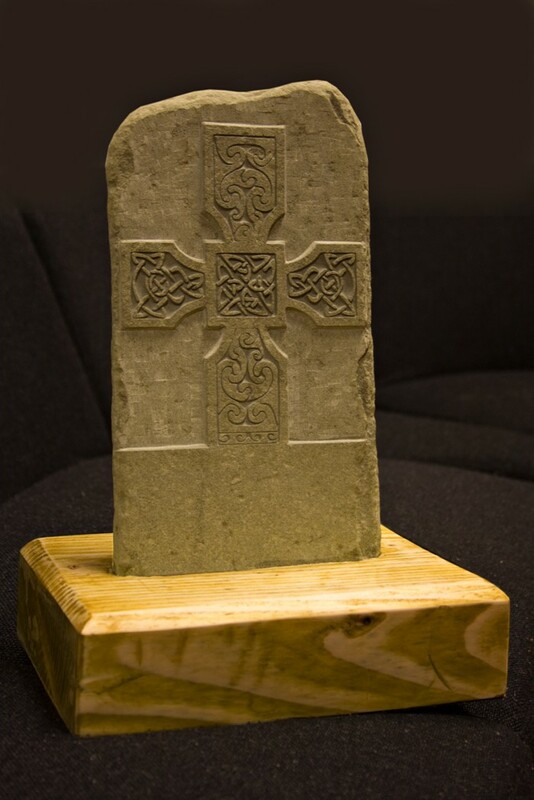 The sculpted replica of the Monifieth Pictish Stone, which has over the passage of time been known as the Monifieth Cross with the original housed in the National Museum in Edinburgh. At the meeting in Monifieth Community Cabin Margaret Copland, president of the society, at short notice, was able to talk on Monifieth – Pictish Centre. 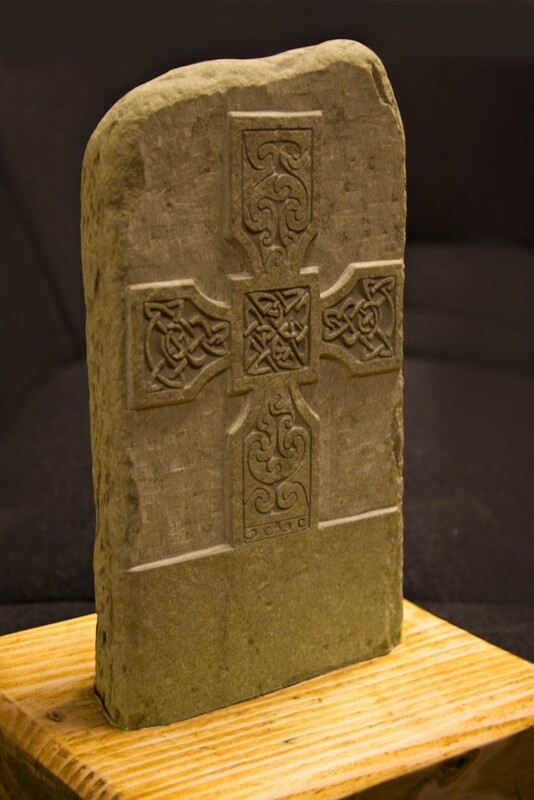 The work was unveiled by David McGovern of Monikie Rock Craft, who has given the cross on long-term loan for display in the Monifieth House of Memories. Group honorary member Dan Robertson accepted the stone. This entry was posted in Articles and tagged Ardestie, Ardownie, Carlungie, Monifieth Local History Society, souterrains. Bookmark the permalink.